Cycling to town today to meet ladies from Mexico's fantastic Sierra Gorda national park, I came across this crazy sight: electric cars topping up at kerb-side charging stations. 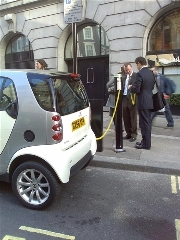 Plonked in Covent Garden, there are a pair of the stations - the first in London outside a car park - which anyone driving a G-Wiz, Vectrix bike or an electric Smart (the EV, out Feb 07) can use to charge up their batteries. The two new charging stations are free to use but limited to three hours per car, to deter hogs. 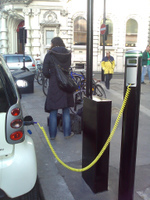 If you've got an electric motor and fancy some free fuel, you just need to contact Westminster Council to get a key for the stations. Oh, and for extra smug points, yes, the parking's free and electric drivers don't have to pay the congestion charge. Two more photos after the click-through. Hello. I work with MC Electric, in Seattle Washington. We are trying to locate manufacturers of charging stations for electric vehicles. We have several large projects that want the stations for their parking garages, but they must also be able to accept payment for usage. We are excited they are willing to put them in. 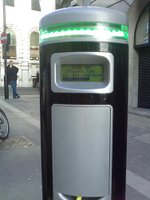 Please let me know contact information where we could purchase pay charging station meters. Thank you.